Christmas Routine – He Said What?! I just wanted to write a brief note about Christmas. It’s been a delightful and very busy week with our Christmas preparations and celebration. Gary’s sister, Sandra, was able to be here with us for the fourth year. We have so much fun as we shop and cook and wrap presents and watch football. It’s a fun time and we love having her come to be such an important part of it all! Aaron asks for days before Sandra comes about when she’s coming………how long she’s staying……….what we’re doing when she’s here…………what will our Great Dane, Jackson, think……….will he still have to go to his day group, Paradigm…………and whatever else crosses his mind that he feels he must put into a compartment and store away for the week of Christmas festivities. Deep, cleansing sigh……………from me……………..”Yes, Aaron, I will come and get you if I can do something………..BUT DON’T COUNT ON IT TONIGHT!!!! !” And I know that tomorrow we will have the same conversation………..and the day after…………..and the day after………. 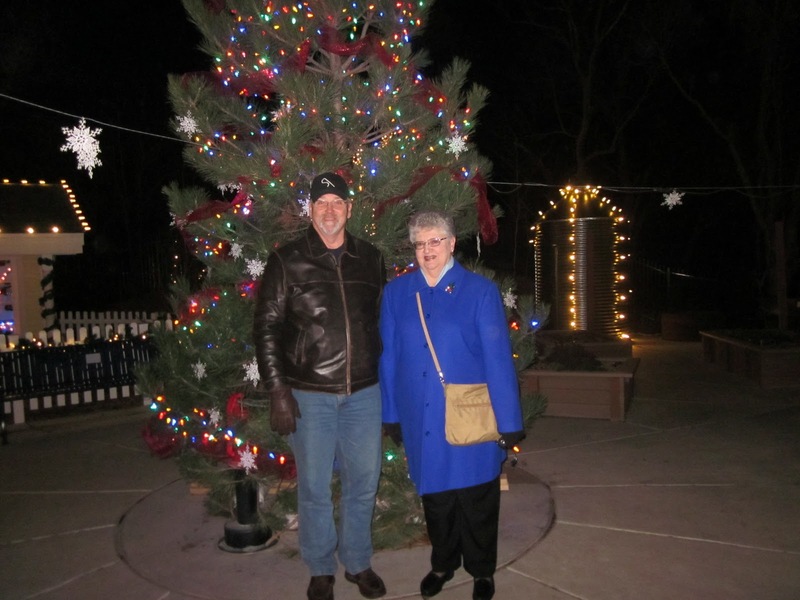 On Christmas Eve, for as long as we can remember, we have driven around town and looked at the Christmas lights. It’s our little family tradition. So days before Christmas Eve, Aaron asks and asks and asks some more just for good measure about whether we are going to look at lights, and if Aunt Sandra is going, and if Andrea and Andrew are going, and am I going, and can we take Jackson. Yes to all the above except for Jackson. Our 200 pound Great Dane cannot fit into our van with the rest of us. Aaron understands, though disappointed, and so on Christmas Eve we drove through several beautiful neighborhoods of sparkling lights and oohed and aahed over the variety and the twinkles and the colors. Aaron had a stomach ache this year and wasn’t very enthusiastic but nothing would have stopped him from going! He woke up on Christmas morning feeling much better and very excited about the coming day. Before I knew it, he was settled in his TV-watching chair in the family room with his blanket over his legs, his clock perched beside him on the end table, his trash can from his room on the floor beside the chair, and his stocking on his lap. He rummaged through the stocking and finally emptied it on his lap, and soon was eating his candy. No time to waste! Each piece of candy wrapper was dropped into his trash can, and the slipper socks that were in the stocking were put on his feet right then and there. I warned him of another future stomach ache and told him of the yummy brunch soon coming and so he put the candy back into the stocking for future use! As soon as our brunch was over and the kitchen cleaned, we all gathered around the family room and Gary led us in a devotional time of reflecting on the wise men and their gifts that they brought to baby Jesus. Aaron sat as quietly as anxious Aaron can sit, petting Jackson and stealing a piece of candy every minute or two. Then it was time to open gifts and as you can see in the picture, Aaron had his trash can beside him and his knife there. 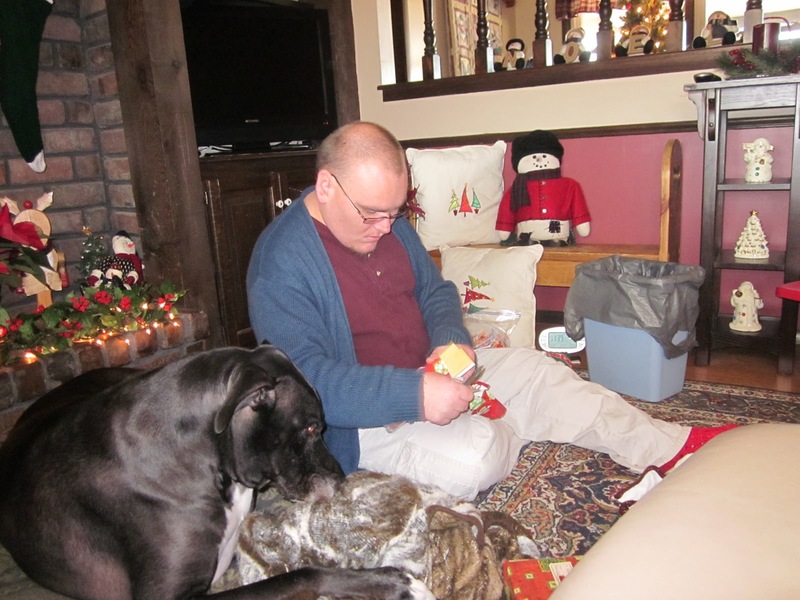 He uses the knife to “help” open his presents and certainly to get the wrappers off his new DVDs – immediately. Right there, on the spot, the job must be done and the papers MUST go into HIS trash can – not into the bags that the rest of us use. And notice his ever-present clock by his side. Telling him the time, for whatever reason he feels the need to know, and the inside and outside temperature – for whatever reason he also feels the need to know that information. The time is soon over, Aaron tosses his gifts onto his bed or floor, he joins us for our Christmas dinner, and returns later to join us as we play Christmas bingo. The game took a long time and Aaron got grouchy. He was glad when it was over, and he could return to his room, to his structure, to his own space and his own world. The day was over and now life could return to normal. And Gary wonders why I sigh so much. I love you, Aaron. Merry Christmas!